In a new twist to the Dublin: One City One Book festival, Dublin and Belfast join together this April in a Two Cities One Book initiative as part of the Ireland 2016 commemoration programme. The Dublin programme of over 70 events was launched in the Mansion House on 9th March by An tArd Mhéara Críona Ní Dhálaigh. Click here for press release. The Festival is organised by Dublin City Council’s Public Library Service and this year is a joint initiative with Libraries NI (the library authority for Northern Ireland). Readers in both Dublin and Belfast will create one big book club as they read the novel and enjoy the packed programme of events in both cities. Dublin City Librarian Margaret Hayes, Irene Knox, CEO of Libraries NI and John Concannon of the Ireland 2016 Commemoration Programme spoke at the launch which was attended by representatives of national cultural institutions, Dún Laoghaire-Rathdown, Fingal and South Dublin library services, government departments and the many partners who organise events as part of the festival. Lia Mills, the author of Fallen, read from the novel and spoke about how libraries have been transforming and enriching the possibilities for books to have a life outside the covers for years. Lia was then presented with a copy of the book in Braille as well as a special audio version of the book. Both were created by the National Council of the Blind of Ireland who make them available for their members. Festival event highlights include the flagship event on 20th April in ‘Findlater’s’ Church, Parnell Square – All Sorts of Wild Reports… This features dramatised descriptions of Easter Week in Dublin taken from diaries and letters of a diverse group of women who experienced the Rising at first hand, a Two Cities One Book Day in Belfast with lunch in Belfast City Hall followed by a tour of the Ulster Museum and a Two Cities One Book Day in Dublin for visitors from Belfast which includes a tour of the ‘Proclaiming a Republic’ exhibition in the National Museum. Dublin: One City One Book is part of the Ireland 2016 Commemoration Programme and is supported by publishers Penguin Random House, the Department of Arts, Heritage and the Gaeltacht and the Department of Foreign Affairs Reconciliation Fund. 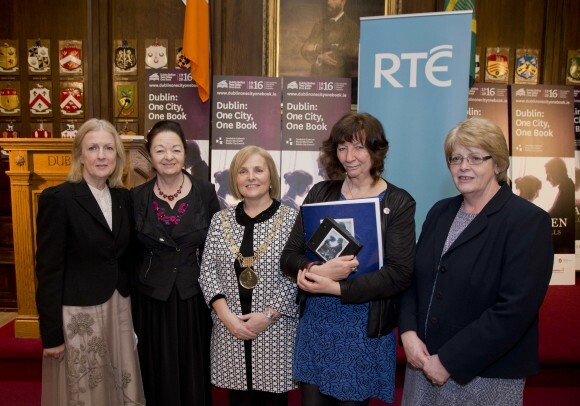 Pictured at the launch in the Mansion House are Margaret Hayes, Dublin City Librarian; playwright Celia de Fréine; Ard Mhéara Críona Ní Dhálaigh; author Lia Mills and Irene Knox, CEO Libraries Northern Ireland.